They say that 4×4’s are not the flavour of the week at the moment, but we’ve tried a 4×4 SUV that’s going to leave a great taste in almost everyone’s mouth. Being honest we did have some pre-conceived ideas before we tested the new Ford Kuga and we wondered if we were going to be driving some old gas guzzling leviathan with and thoughts of Maverick and Explorer rushing back to us we hoped that Ford was not again going to lumber us with some car that whilst at home on the Interstate, was pretty dam useless on the roads of Norfolk, So being honest, it was with some trepidation we started our appraisal of the new Kuga, but fact is, we ended up plainly and simply loving it. On the outside, if you’ve seen the Kuga, you will know it’s as attractive as anything in its class and frankly, we think more so. There is no doubt that Kuga really does has a serious presence about it, but it’s not aggressive, it’s kind of friendly and whilst for sure, it’s a big car, it certainly didn’t eat all the pies. OK, Kuga is a 4×4, and not many of us actually do any serious off-roading and frankly, with a visit to a car boot sale or perhaps a country show about as far away we ever get from the black stuff. Whilst we didn’t try the Kuga off road, if you are looking to serious off-roading, well you would probably be better of spending your money on an X-Trail or a Land Rover. Kuga is a different kind of 4×4, it’s a car that’s as happy in the city, on country roads or on the motorway with the added bonus that should you need to drive up a muddy boggy farm track to pick up your free range eggs, or should the ice age suddenly arrive, well the Kuga’s going to do the job well and get you where you want to go safely. Jump in the drivers seat of Kuga and well its all very familiar and that’s because it shares many of its components with Ford’s C-Max and of course the Focus, which everyone accepts is one of the best cars out there, so that cant be bad. Yes, the Kuga is 4×4, but you’d never know it from the inside, OK you can see over people hedges and into their back yards, but outside of that, you would just never think you were driving a big SUV. The Kuga’s ride is smooth, comfortable and quiet with no feeling that you’ve got loads of mechanical goings on happening beneath the floor and we really believe the Kuga sets new standards in this class for the way it drives and rides. There is a heck of a lot of brand snobbery when it comes to buying cars in the UK and in the same way, some people won’t buy a thinly disguised Audi, called a Skoda, some other people won’t buy a Ford, because it’s a Ford and we have decided, we are going to rename that as “brand foolery” and whilst you think you might look super cool in your over priced prestige badged cars, don’t you realise that others are looking at you thinking what an idiot, as you could get a far better car, with much better equipment, for sometimes half the price. It’s the same, if you are in business, how can anyone take your business decisions seriously when you make such a stupid decision as far as your choice of wheels are concerned. Talking of sense, lets look at the practical side of the Kuga. Can you believe that the CO2 for this car is just 169g/km, and to put that into perspective, a normal basic 1.4 Renault Megane hatchback, produces a CO2 of 165g/km “just 4 points lower than the Kuga” and it’s an even better story on fuel, The Megane has an combined average MPG of 40.9 (Kuga is 44.1 MPG) and an extra urban MPG of 50.4 (Kuga is 52.3 MPG). We didn’t pick the Megane specifically, it could have been one of hundreds of cars and was just a random choice to represent a normal modern family car, but it demonstrates that the Kuga is a pretty hi-tech piece of engineering. To highlight that further, there is currently only one 4×4 “crossover” type vehicle we know of that can beat the Kuga’s low CO2 and that’s the much smaller Nissan Qashqai, but you have to choose the much lower powered 1.5 version to do it (and that’s not really comparing like for like) is it. The Kuga only comes in 2 models, Zetec and Titanium, with plus packs available if you want to spec it up further. Keeping it simple, well there is only one engine available and that’s the Dagenham built, 2.0 ‘Duratorq’ TDCI 136 engine, which out of interest, Ford now produce for Citroen, Volvo and Peugeot. We tested the Kuga for a week over different types of driving, ranging from city, to main road, to country roads and whilst to our surprise, even with some shall we say “enthusiastic” driving, we easily achieved over 40 MPG and in fact, over 45 MPG on one days testing (just driving it a little easier) and because of that, we feel pretty confident that on what they used to call “a run” it would be possible to achieve close to Ford’s claimed 52.3 MPG. Fact is Ford have produced what is quite simply one of the prettiest, most agile and easiest to live with and nicest to drive 4×4 SUV’s we have ever tested. Everyone we spoke to when we were testing the car wanted to crawl all over it and everyone was really impressed by it. 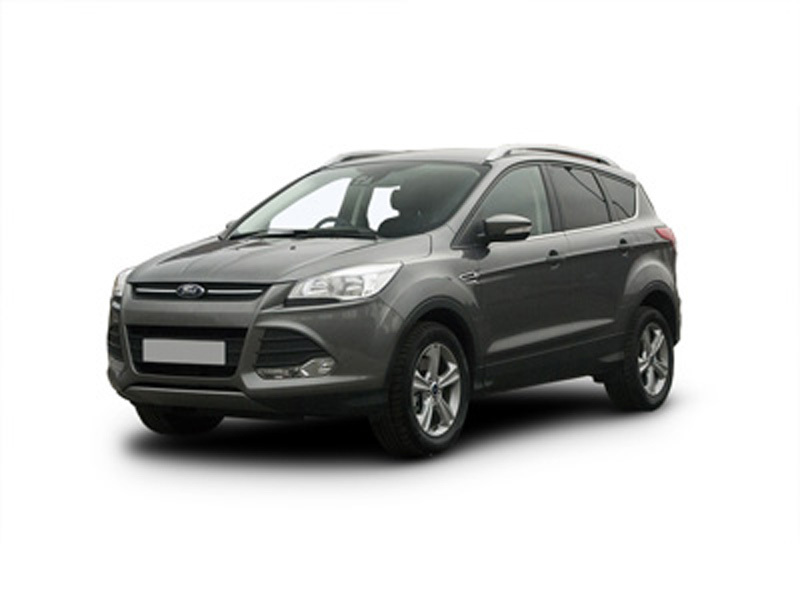 For a quotation on the ford Kuga, or any other vehicle, please contact us.